Lunada Bay Tiles’ Tomei Modules in Frost Green, Parchment, Pelican, and Sand Dollar blend. 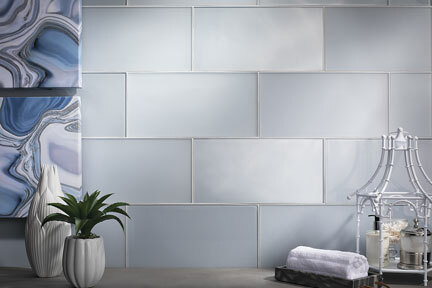 Lunada Bay Tile introduces Tomei Modules, a versatile collection of large-format glass tiles that combines clean lines with a refined palette for a unique take on the contemporary aesthetic. Tomei Modules’ larger rectangular forms echo the geometric arrangements of modern architectural masters like Frank Gehry, Zaha Hadid, and Ludwig Mies van der Rohe. 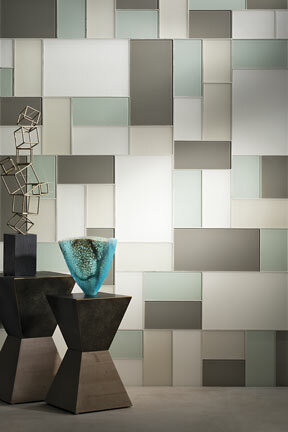 The tiles are ideally suited for creating tailored statements from gentle panoramas to bold and playful abstractions. Tomei Modules offers a discerning approach to neutrals suggestive of misty fogs, budding leaves, and broadening horizons. The collection was carefully curated to complement a variety of cool and warm tones appropriate for residential and commercial settings. The 11 hues, from cloud-like white to soft fawn, can be used alone for a dazzling impression of color or combined to create a more dynamic arrangement. Each color is available in a Natural (glossy) or Silk (matte) finish to further develop the desired effect. The collection comes in four sizes: 6 x 9, 6 x 12, 9 x 18, and 12 x 18 inches. Learn more about Lunada Bay Tile and view the entire product line by visiting www.LunadaBayTile.com, or by calling (310) 257-1300.